In addition to our wildly popular and successful energized waters – specifically our Convivial House Cat and our Flower Essence Formulas for Cats – the placement of the crystal Amethyst throughout your home has some surprising benefits for changes in behavior and in health. What we love is when something benefits cats and their people at the same time. This to us is a huge win-win and it’s what we are all about. We are advocates of great benefits, good health and good behavior, plus a lot of love and kindness for all! Gemstones and crystals have been used medicinally dating back to the ancient Greeks and Romans, and going further back to at least 25,000 years B.C. in India, China, and South America. Surely any ancient culture worked with the stones and crystals indigenous to their area. It’s not just the stone itself, but the shape, color, and feel also contribute their gifts and meanings. Placing Amethyst in Your Home! Aside from what they can do for your body, Amethyst crystals are one of the most beneficial stones to have in your environment. Due to this, many people fill their homes with them—in their bedroom, living room, bathroom, office, meditation room, and from our viewpoint they should go near cat litter boxes, and where cats eat and spend most of their time napping. And yes, put one in your car too. The purpose is so that the amethyst healing properties constantly surround, influence, and protect them. Amethyst works to purify any space of negative vibrations, emanating an energy ideal for you to thrive in and be happy in. They help to clear the mind of unnecessary thoughts and clutter. On a physical level, having amethyst crystals in your home is believed to help strengthen the immune system and heal any imbalances that lie in the body. Amethyst clusters and Amethyst geodes carry the strongest power to rid your home of negative energy or to correct bad behaviors of those who live there which makes them the best crystals to fill your home with. Key places to put Amethyst is anywhere that’s central to your home such as on your fireplace, coffee table, dining table, or any other place that’s central and important in your unique home. We want Amethyst’s healing properties radiating inside each room, creating almost a tempo or resonance between them that’s full of life and beneficial healing. Also place placed near each door that comes into your home from the outside to prevent bad energies from entering and causing interference. If you have a front porch, or a side or back step place one there too. For cats they can be tucked into a cat’s bed or in the corner of a favorite sofa so that the loving and soothing energy can be right where a cat is spending most of the day and night which is usually sleeping and resting. They can go in your cat’s dining area and near their litter boxes (which are ideally in separate rooms and far away from each other. 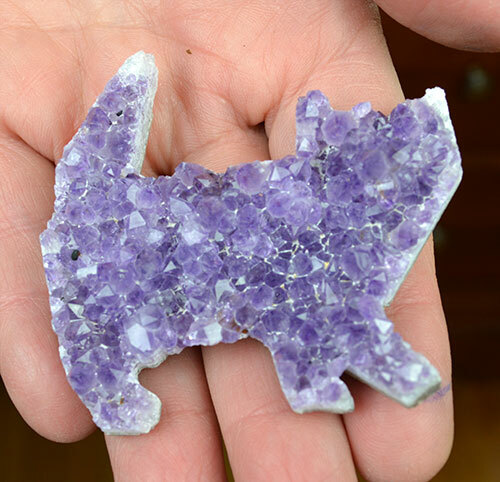 Amethyst carved into the shape of a cat might be particularly useful to our domestic cats and surely could assist in positive changes in their behavior particularly when Cat Faeries Flower Essences for Cats or Convivial House Cat is placed upon it. This would be after you cleansed it, energized it, and set your intentions as we detail in our crystals handout that comes with your order. If you are a person who has a hard time falling asleep or staying asleep Amethyst crystals are even thought to helpful with insomnia or middle of the night agitation. They dispel anger and bitterness. Placing an Amethyst cluster in your business is thought to attract abundance and bring new opportunities walking through the door. Do you use a sauna? Take an Amethyst with you and set it near you to dispel the toxins that are releasing. Many feel that unlike quartz crystal that Amethyst charges itself especially the darker the purple it is. Other crystals and gemstones need to be set out in the sun for charging but all that’s needed to clear your Amethyst is cold running water. 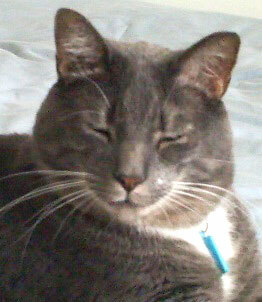 Once you have cleansed your new Amethyst carved cats place them in special or cat loving places. Near the water bowl BUT not in it as there could be traces of toxic minerals not visible to the naked eye. It’s also best to not place them in water bowls as the cat’s saliva will coat them with biofilms which would require washing with warm soapy water. See our blog article on biofilms. Step two: Program it by holding it in your hands, near the cave of your heart, and say the words or phrases which describe the changes in your cat’s behavior or health that you wish to see occur. After you do this say a heartfelt thank you. The flowery or more poetic your speech, the better! Step three: Place it or them where you desire making sure that the location is easy and convenient for you since you’ll be applying drops or sprays daily. Step four: Put a few drops or sprays of the product of your choice which would be one of Cat Faeries Flower Essences for Cats or Convivial House Cat. You can use more than one remedy at a time. Do this daily until the situation has changed or for maintenance. Step five: Once a week or so give the Amethyst a rinse under cold water to remove dust and dried flower essences or Convivial House Cat. It probably won’t need re-programming, but do it anyway, crystals of all kinds love being cleansed and they LOVE being talked to and thanked! More detailed instructions come with your order, save them! Crystals and flower essences, pairing two powerful and effective modalities! Many years ago, a few of us flower essence visionaries did an experiment. We wanted to see if we could beam or transmit the vibration from our flower essences to another person or animal by using crystals. We thought that in theory it would work, but we wanted to thoroughly test it out to make certain. We gathered our own single essences and several of Cat Faeries formulas for cats which feature the vibrations of flowers, trees, mushrooms, and gemstones. We selected a few people who had cats or other animals who agreed to be part of an experiment but who didn’t know the details therefore we could conduct a “blind test” with zero influence from our test subjects. To create a “double blind” test we covered over the name of the essence on the bottle, and shuffled them around so we would not know which we were applying to our crystals. With giddy joy, we found that putting a few drops of a flower essence on a crystal, then following with the power of our minds and the intention of our spoken words asking the crystal to transmit the energy to the person or animal that it had worked. When we checked in with our subjects and asked if they felt or noticed changes either for themselves or their furry friends every answer was yes! Some people told us they actually preferred the use of crystals as it felt more powerful, but still gentle, to the traditional methods which include people taking drops in a glass of water or under the tongue, and for cats and other animals, putting drops in a cat’s food or water, anointing a cat’s fur, paws, ears or back. Wondering if our success was serendipitous we did this 5 times over the course of a few months and each time with different subjects. The results were the same, we always got positive feedback and lots of YES! This new amplified way of using flower essences on crystals was working and we couldn’t have been happier! Getting to know Cat Faeries crystals – new specimens have just arrived! There is a very special mine where our crystals come from where the stones are mined with integrity and care. The quality is superb. The vibration of these crystals is pure and they await YOU to clear them and to set your intentions so that they may serve you, your cats, and all of those who you love and care for. We are fortunate to have crystals called Golden Healers which are a quartz crystal that grew on or near Iron Hydrate and gives them a wonderful golden color, a golden glow, or a wash a golden yellow. This golden color adds to the healing power of quartz crystal. Golden Healers are rather hard to come by, and healers collect them and cherish them. 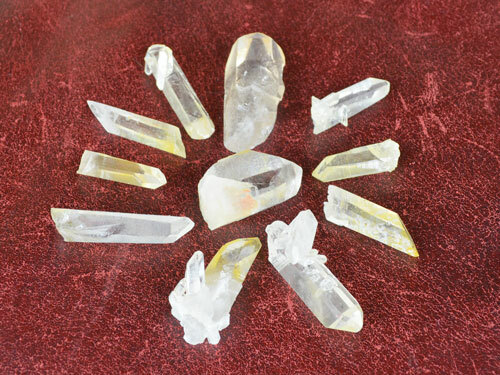 They are for anyone who’s intrigued by crystals and likes having them around for their beauty, or who is serious about crystal healing and wishes to elevate their work with crystals we are honored to offer you Golden Healer Quartz. In Vedic astrology, this color represents the planet Jupiter, it’s day of the week is Thursday which would be the ideal day to do your crystal healing. Thursday is a positive day, a day to wear yellows and oranges, to feel grateful and to be productive, and to take care of our health and the health of those we love. This is a good time to expand your consciousness and to learn something new or elevate what you already know, and crystal work will compliment this perfectly. Gazing upon a golden healer for 3 minutes on a Thursday will soothe the eyes. Currently in our collection we have two categories of specimens of Golden Healers: 1) Chubby or Pointed which are more the usual crystal shape with a point that is either pointy or rounded, or which might be an irregular shape. 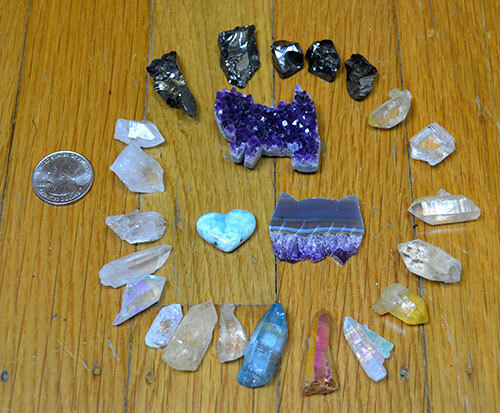 These are sold individually and we select them for you based on your name or the name of the cat who needs crystal healing. 2) Grab Bags which contain a mix of what we call “pin needle” crystals that are long, narrow and have a point or are smaller irregular shapes. There are 5 to a grab bag. When you order you’ll use the COMMENTS area to tell us who the crystals are for and its ok to tell us the condition you are hoping to correct. Coming later this month we will offer a few larger specimens sold individually, which were weighed and photographed so you can purchase the one that speaks to you. If you like your crystal “water clear” we also have beautiful AAA grade quartz which is may have some cloudy elements, something that healer love too. They have points and are sized around 2 inches in length. When you order flower essences from Cat Faeries we include our lavender color handout which will have the various ways you can use flower essences including how to work with crystals. Golden Healers are themselves master healers, therefore they will help you master your own healing work. They will help you access The Gold Ray. They will help you transform, transmute, grow, change, evolve, find and feel joy, blossom and flourish. They assist you when you need to dissolve negativity and release it. Access your own Christ consciousness, Angelic and Devic energies, and the Goddess within. Golden Healers have a very high vibration or frequency and are very well suited to flower essence work. Welcome to a special clan of healers who work with Golden Healers. Join us in doing your own healing work to benefit those you love and care for, and those in your unique community. Quartz Crystals are powerful and beautiful and will boost the effectiveness of flower essences and of Convivial House Cat. All you need to do is place a few drops of either (or both) products on your crystal and it will beam the vibration to where you’ve directed it. So simple! Detailed instruction will be found in your hand out for Convivial House Cat and our flower essence formulas.